OK, this project is evolving before our very eyes! We were able to obtain a couple more batches of Bombs to fulfill the requests of roughly the first 100 people who responded to our offer. Those Bombs will ship out to us next week some time and we'll forward them onto those of you we've already been in touch with. We have worked diligently all day yesterday to respond to each and every email we got, whether or not we have a free Bomb for you. I reached out to the good folks at Delicious Drips yesterday for their help. They are actually far more entrenched in the DIY/custom toy scene than we are and because they are awesome, they volunteered their help in several ways by co-sponsoring the Custom Bomb project (which we have given a real name: "Who's da BOMB?!"). Delicious Drips has a wonderful community-driven Custom Toy Submission section which is brand-new. 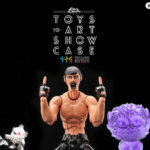 You can sign up and submit your custom toy to be voted on by the community. Why is this cool? 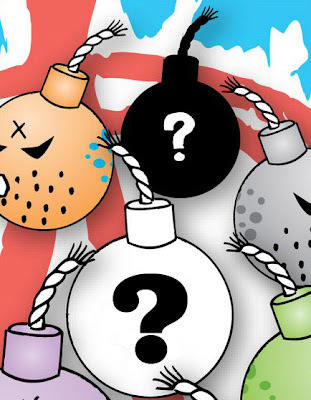 Because once you have finished your custom Bomb, not only will you email images to us at Tenacious Toys but you can also upload the image to Delicious Drips and have your custom Bomb voted on! Because that will be a time-sensitive endeavor, we have set a hard date for submissions: August 31st. The 3 winners with the most votes on their Custom Bombs will receive one of 3 REALLY awesome prizes which we will announce in the flyer, which I will work on this weekend! Honestly these are actually quite valuable prizes so I need to personally thank Lief from Delicious Drips for very generously volunteering to co-sponsor the Who's da BOMB?! project. It's really taken the whole concept to the next level. If you are one of the hundreds of people who was not able to get a free Bomb from us, you can use a special coupon code for $2.00 off the purchase of a 1.5" Toy2R Mini Bomb from Delicious Drips: whodabomb is the code you should use. Keep checking back here for the flyer which I will hopefully be able to finish by the end of this weekend. Thanks everyone for your interest in what is shaping up to be quite an extensive Custom show! Custom Toy2R Mini Bomb Show-Off: Out of Bombs! The response to our last post was absolutely, completely overwhelming! We have already packed up 3 dozen Bombs, everything we had in stock, and shipped them off to the first responders. We have also contacted Toy2RUSA to get more of them for the rest of you. Seems the US distributor has fewer than we thought so regrettably we are going to cut off the requests at this point, unless there's some hidden stash of Mini Bombs somewhere. Once we get the next batch, we will of course ship every last Bomb we have to as many of you as possible, in the order that you requested them. Thanks everyone SO MUCH for the incredibly positive responses! We are very much looking forward to seeing these customs! Lately we've been sending a few customizers some figures to work on and we were very taken with the customs they produced. 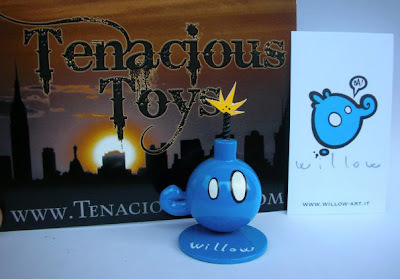 An Italian artist that goes by the name Willow sent us this picture of a custom 1.5" Mini Bomb we sent him: ...and that got us to thinking: these Mini Bombs are so small, ANYONE can finish one in an hour or so. The shape is really simple and lends itself to creative customization. Each Mini Bomb also comes with a disc-shaped base which can also be painted or customized. So, here's the deal: email us with your shipping address if you want one of these Mini Bombs to customize. All we ask is that when you are finished, you email us a nice big picture of your Custom Bomb. I've already been in touch with Toy2R and they said they'd post up pics of all the customs on www.Qee4All.com! I'll also post up the pics in an album on Facebook and link to your website if you have one. AND, if you want us to, you can mail the Custom Bomb back to us and we can sell your custom on our website for whatever price you want to ask for it. We won't take a commission out of the sale price, just the wholesale cost of the Bomb and anything we spend on shipping. And we'll Paypal the rest of the money to you. We're calling this project the Custom Bomb Show-Off because it's not really an official custom toy show, it's basically just a low-cost way for you to show off your customizing skillz and maybe get some recognition.